New year, new challenge from my beloved baking club, KBB. Yang dipilih oleh para host tampaknya juga dalam rangka merayakan tahun baru cina karena kue yang dipilih berhubungan sangat erat dengan budaya Cina. Apakah itu? Yup, FORTUNE COOKIES! I love fried rice. The simplest it gets, all the more reason for me to love it. Garlic Fried Rice is a perfect example of it. you just need garlic, lots of it. Hmmm… What a perfect breakfast to start the day. It’s the weekend. There’s no better food thank junk food on the weekend! 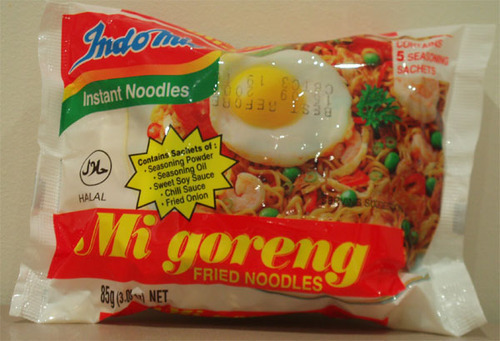 One of my favourite junk food is Indomie Mie Goreng. It really is the most delicious thing ever! But as much as I love it, I never make it just as it is. I always have to add some more ingredients to it. One of my favourite way to do it is this.